A week ago Monday, we got to visit yet another community, this one in La Plata, 40 miles away from Rutledge, called the Possibility Alliance (and also known as the Still Waters Sanctuary). I had hoped to visit it after I was done with my Dancing Rabbit visit because the train station I was being dropped off at is in La Plata. However, I was told the only time we could visit was in the middle of our DR stay (because they’re in a ‘retreat year’), so I figured it wouldn’t happen. However, it turned out that most of the visitors group wanted to check out the Possibility Alliance and a couple of people had cars so a whole bunch of us went off attend their community tour. Nonviolent Activism, 4) Self Transformation, and 5) Silliness, Celebration, Gratitude, and Joy. Finally, after quizzing us on things like dying people’s regrets and what our most passionate wishes were, he led us on a tour of the sanctuary. were building, the very mellow draft horses that they own, the pond that they’ve recently tranformed, and the land and how they’ve been taking care of it. Life at the Possibility Alliance is extremely low-tech. They don’t have electricity (they use candles, they also don’t have a website although they do have a phone). All the building done there is with hand tools rather than power tools. They try to apply permaculture principles to their work. They also run on ‘the gift economy’–taking what is offered but not charging for all their courses and workshops, including a permaculture design certification course which other places often charge enormous amounts of money. We all enjoyed the tour and the place, although we were clear that this was only a taste of what the place was about. For another view of the PA, see this post by leavergirl on her blog Leaving Babylon. Last week, we published a piece on two income sharing systems called “Allowance Versus Box of Money” (which I’ve also heard called Dual and Unitary income sharing systems). Although I thought it was a really interesting article, I had a couple of difficulties with it. I think one of the main reasons for creating new communes, is (as I also heard someone say) to create ‘new flavors’ of communal living. This is why there are five different income sharing communities in Louisa County, VA. I think it’s important that there are many options for income sharing, that some communes are high structure (say Twin Oaks) and some communes are low structure (say Acorn), that there are communities that approach a middle class lifestyle and communities (like Living Energy Farm and the Stillwater Sanctuary) that are already preparing for life beyond fossil fuels. I’ve heard some folks talking recently about communities of people of color. I’m not threatened by this, any more than I’m threatened by women’s communities. And as much as I’m an advocate for egalitarian, income sharing communities, I’m well aware and even happy that this is only a small percentage of all the communities out there–there are co-operative houses, cohousing communities, ecovillages, hybrid communities of all kinds, and many varieties of spiritual communities, to name the most common ones in the Communities Directory. Again, we’re creating more options for people, not less. And I’m well aware that not everyone wants to live in community. The point is that I think there should be all kinds of communities (and particularly income sharing communities) for those that are looking for them, because different people will do better in different communities, just like the ‘box of money’ approach will work better for some communities, and the ‘allowance’ approach for others, and using a ‘gift economy’ for still others. As David from las Indias said, in an article on diversity that we published a year ago, “The kind of diversity many of you are concerned about … will come by itself, but probably not to every community, but to the network we must build together.” While diversity within communities is important, I think diversity among communities is crucial. I’ve written about the Federation of Egalitarian Communities in my post [on my blog] on Egalitarian Communities, and about Twin Oaks in a post entitled Real Models 1:Twin Oaks. What I want to write about here is what is happening in Louisa County, Virginia, where Twin Oaks is located. …given the size and stability of Twin Oaks and Acorn, with their help, this (and Living Energy Farm) will probably succeed. In fact, at this point, Twin Oaks and Acorn both have long waiting lists of people who want to get into them. The waiting list at Acorn is at least six months and I suspect the waiting list at Twin Oaks is a lot longer. I find what’s happening in Louisa County very inspiring. There’s a growing community of communities there within a few miles of each other, backed by the durability of Twin Oaks (and now Acorn) and an apparent real longing for community, as evidenced by the waiting lists. But what’s really amazing is that Louisa County isn’t the only place this is happening. 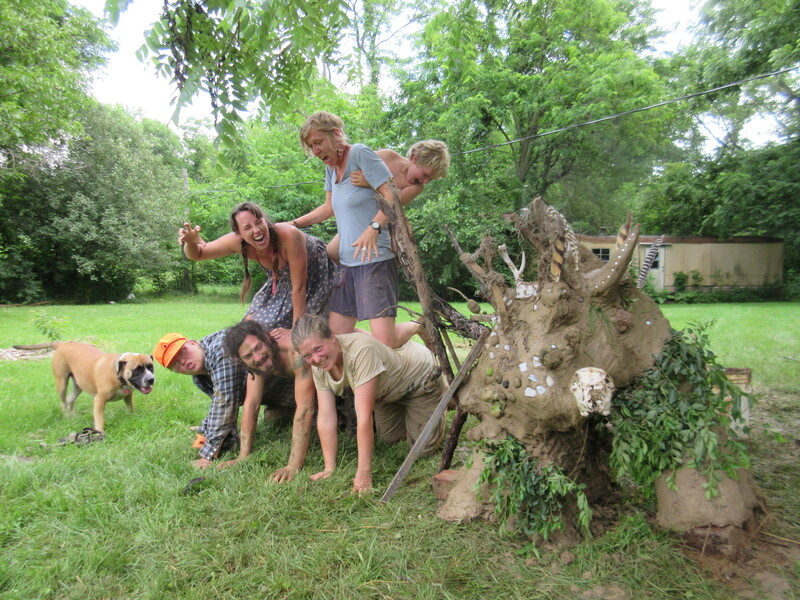 In Rutledge, a small town in northeastern Missouri (population 109) there are also three growing, thriving intentional communities that are working together. Sandhill Farm is the oldest, started in by four 24-year olds in 1974, now at maybe eight members. That may not seem impressive, but the fact that Sandhill was there and supportive encouraged a small group of students from California who wanted to build an ecovillage to settle there in 1997 (incidentally, the group began to converge in 1993, the same year Acorn started). Dancing Rabbit now has sixty-something members, residents, and children. They are talking about wanting 500 to 1000, but even having sixty now is pretty good. Among other things, Dancing Rabbit wants to have a “Society of Communities”. One community within Dancing Rabbit is Skyhouse. Dancing Rabbit isn’t an FEC community but Skyhouse is (and so is Sandhill). 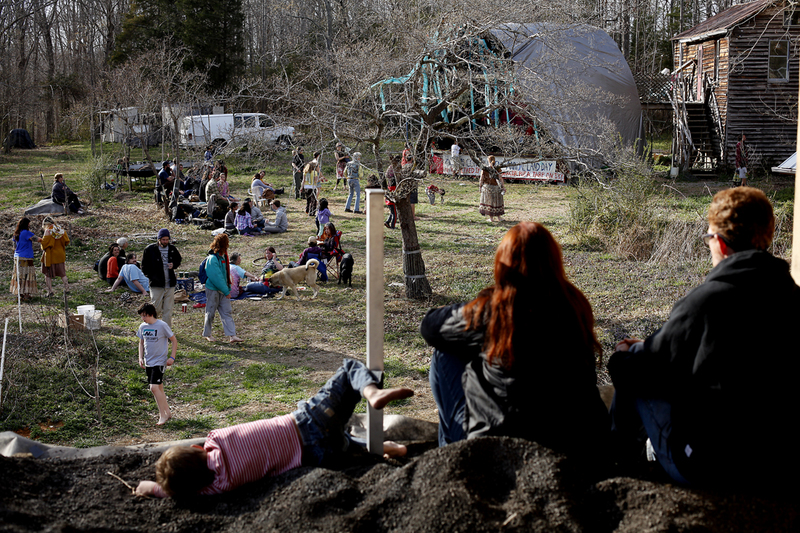 Then, in 2005, Red Earth Farms, “an intentional community of homesteads” bought 76 acres of land adjacent to Dancing Rabbit. There’s now about seventeen adults and children living there. From what I understand, there is a lot of traffic back and forth between the three communities–and a lot of support for each other. And, not far away, in La Plata, Missouri, is the Possibility Alliance, very interesting community of nine folks that has some links with the three Rutledge communities. In addition, some students from Colby College are making a film about the three communities called “The Rhythm of Rutledge”. Paxus has written a post called “The best parts of America” where he talks about all these communities as well as some of the other FEC related communities around the country. It’s a nice overview of this process. What is so exciting to me is the building energy in Louisa and Rutledge. Far from the urban mainstream, folks are gathering (about 130–so far–in VA and nearing a hundred in northeastern MO) and supporting each other in building communities. The long waiting lists for the communities in Virginia shows the hunger for this and the durability of the communities. The fact that Twin Oaks has also been running strong since 1967 is an interesting answer to “Whatever happened to all those communes from the sixties?” I think it’s also significant that Sandhill has been hanging in since the seventies and has managed to attract and support two other communities in their small town. Building strong vibrant egalitarian community is possible, and even very successful, at least in two places in the US. Addendum (5/13/16): There are now five (5!) income sharing communities in Louisa County, the two newest being Sapling and Cambia.